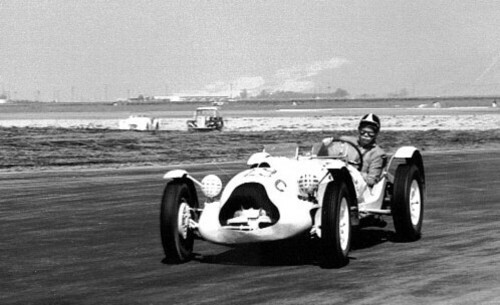 Willis Baldwin of Santa Barbara, California built four early sports/racing specials. Ron Yates contributed the photos below; I think this is the second of the Baldwin cars but I'm not sure of that. 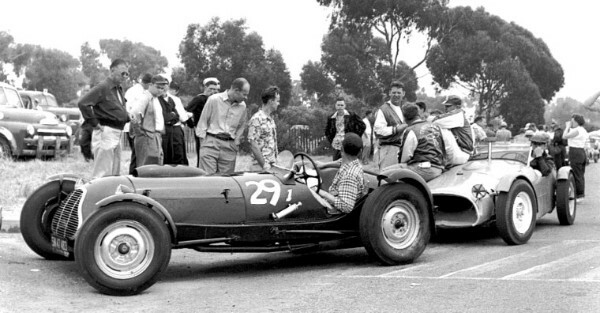 One of the Specials at Torrey Pines in 1953. (This looks like the car raced by Jim Herlinger at the Monterey Historics.) This car was shown at the 2003 Pebble Beach Concours. This car is raced today by Don "Slim" Pepperdene in west coast historic events. "Bill Baldwin was a neighbor of my parents in Santa Barbara. He owned a garage/shop on Milpas St. and tinkered with cars at his home in Montecito. I was rebuilding my '51 MGTD and wanted to port the head. Bill loaned me a die grinder and gave me instructions. While talking he showed me a Kurtis roadster that he was preparing for road racing. He pointed out the very small driver's foot well and said he was going to move the accelerator and brake pedals to the right hand foot well thus "spread-eagling" the driver. Bill was a bit of a recluse and, once the die grinder was returned, I never heard of the car again. He was allegedly an heir to the Baldwin-Lima- Hamilton family fortune. I was 16 at the time, 1958, although it could have been 3-4 years later. Unfortunately, I remember nothing else of this car. Perhaps it is/was the Baldwin Special although it may have been one of Bill's earlier creations." 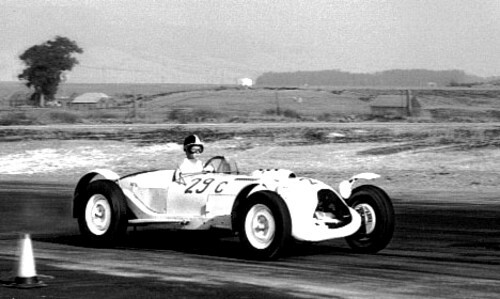 The same car at Stockton in 1955. It's driven here by Floyd Kenyon. Another shot of the Baldwin Special at Stockton in 1955.